A "hidden treasure". 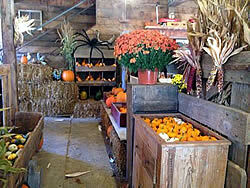 A place like none other--ample parking, surrounded by fall splendor, located on a dead end road, a safe environment, free admission as well as a complete selection of pumpkins and other fall decorating needs. 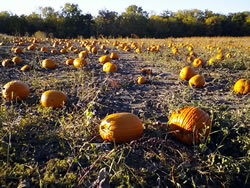 The pumpkin patch began in 1988 accidentally. The vacant feedlot was overgrown with weeds. Pumpkins were planted to "hopefully" smother the weeds. 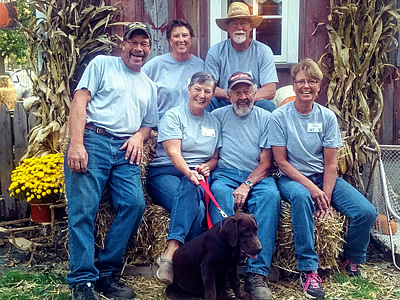 It did not work, but the pumpkins grew and needed to be washed, loaded, hauled and unloaded in stores in Austin, Albert Lea, Blooming Prairie and La Crosse, Wisconsin. 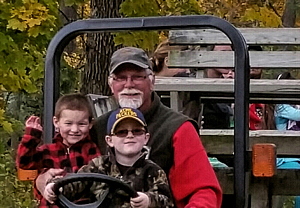 Friend Dean Zellar asked if he could bring his grandchildren out to "Farmer John's" to pick their pumpkin in the patch, thus the name Farmer John and the pick your own tradition was begun. For the great service you expect, see Kirk (our son) and Mary, Deb (our daughter) and Dean, as well as Joseph our grandson. 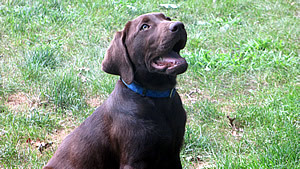 Our Chocolate Labrador Stine (rhymes with Lena) is ready to welcome each of you- young and old. The Ullands began farming and feeding cattle near Glenville in 1960 and moved "home" in 1962. 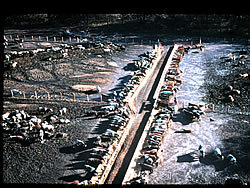 The feedlot was built in 1973. 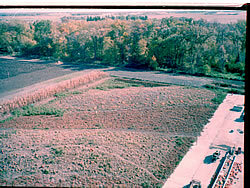 10,000 yards of "strippings" from a gravel pit were hauled in to make mounds for the cattle to stay "dry". 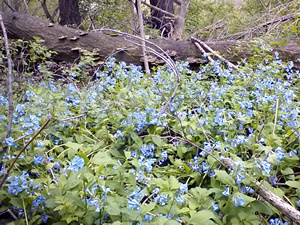 Several trees were cut and buried making a very rocky, but fertile soil which cannot be leveled. The last cattle were fed in 1986. 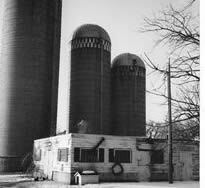 The first silo 18'x50' was built in the early sixties, followed soon by a larger silo, 20'x60' (Straw Bounce). The 24'x75' (Silo Slide) with a bottom unloader was erected with the feedlot in 1973 to store high moisture corn to feed to the steers. John's father, Palmer, was one of the original Ulland Brothers Inc., a road construction business; therefore the Ulland Brothers shop and office were directly across the road from the home until 1993 when Ulland Brothers moved to Albert Lea. 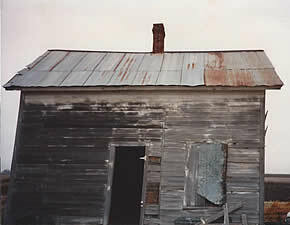 This was purchased to maintain the privacy of this great location on a dead end road. This site now provides acres of off road parking as well as rental storage for recreational vehicles, boats, cars. etc. 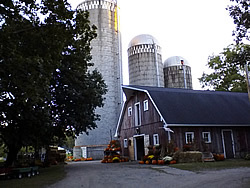 The barn was built in 2003 using the original floor and foundation. The exterior was salvaged from a local barn damaged by wind and the interior was salvaged primarily from our original barn. The structural components are new. A close look inside reveals a lot of history of farming in the early 1900's. The lowe level provides the shopping area at one end and a work area at the other. 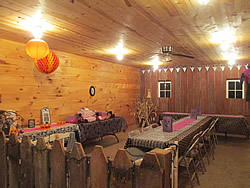 The loft is divided into a "classroom" and a party area. In 1994 Alice's old house was moved across the field and added onto our original house. 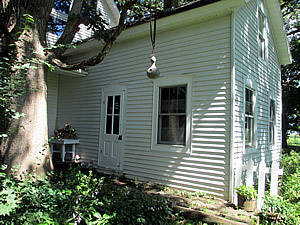 Alice's house was the oldest "frame" house in Freeborn County, built in 1868. The first Ladies Aid of Red Oak Grove Lutheran Church was formed here. 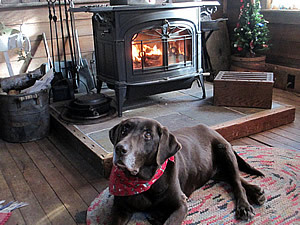 It now provides our favorite winter "hangout" in front of a roaring fire. 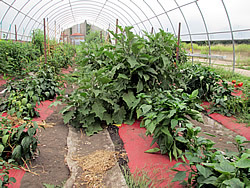 This was erected in 2005 to provide a chemical free, solar heated, controlled environment to primarily grow tomatoes. 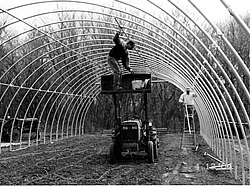 The soil inside is plowed in the fall and early in the spring an irrigation tape is placed under red plastic for each raised row. 300 tomato plants are planted in the soil in early April. 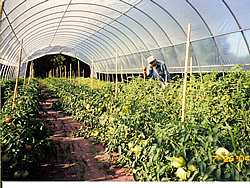 The solar heat speeds growth so the tomatoes are ready for market by early July. 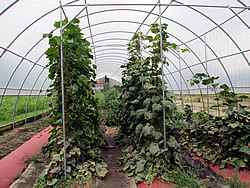 Kirk and Mary began doing the farmers' market in 2014 and now are growing cucumbers on a trellis, as well as peppers, eggplant, along with the tomatoes to give customers at Farmers Market Place a wider selection of early vegetables. 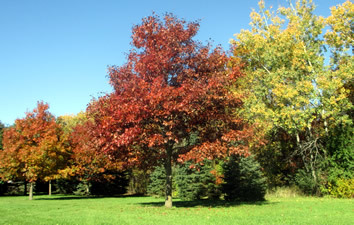 Beautiful trees surround the patch on three sides. 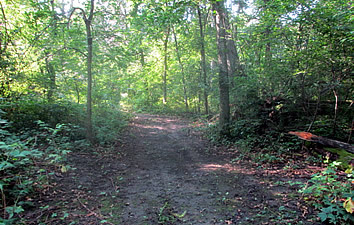 These woods are home to many deer which cause a lot of damage to pumpkins as well as the growing fruits and vegetables. In 2016, 2 does raised 5 fawns.